Bob Forsch might have spent his entire playing career with the Cardinals if management had given him the opportunity. Instead, informed he wasn’t wanted, Forsch took the chance to extend his career with the Astros. On Aug. 31, 1988, the Cardinals traded Forsch to Houston for utility player Denny Walling. 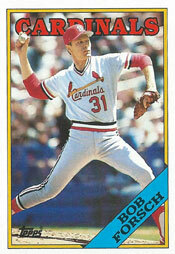 Forsch was 9-4 with a 3.73 ERA for the 1988 Cardinals. A fan favorite, he ranked second among all Cardinals pitchers in career games started (401) and third in career wins (163). In his book “Tales from the Cardinals Dugout,” Forsch said general manager Dal Maxvill called him while the team was in Atlanta and told Forsch he planned to trade him to Houston. Under baseball rules, Forsch, 38, could have blocked a trade because he was a player with five years of service with one team and 10 years in the majors. The second-place Astros, chasing the Dodgers in the National League West, were pressing for a decision before midnight on Aug. 31, the last date a player could be acquired and still be eligible for the postseason. Encouraging him to accept the trade, Maxvill told Forsch he wasn’t in the Cardinals’ plans for 1989. Forsch said he wasn’t ready to quit. When the Astros sweetened the deal by guaranteeing Forsch a contract for 1989, he agreed to the trade. “It was better than what I was offered here,” Forsch said to Rick Hummel of the St. Louis Post-Dispatch. “Maxvill made it pretty clear that I wouldn’t have a job here. In his book, Forsch said he approached manager Whitey Herzog before accepting the trade and Herzog told him he would have a chance to make the team during spring training in 1989. Maxvill said Forsch would be offered a job in the Cardinals organization if he didn’t pitch in 1989. A consistent winner and classy competitor, Forsch pitched two no-hitters and appeared in three World Series for the Cardinals. The right-hander produced 10 double-digit win seasons for St. Louis and was 163-127 in 15 years (1974-88) with the Cardinals. Also, Ken Forsch, Bob’s older brother, had started his big-league career with Houston and pitched for the Astros from 1970-80. Two days after Bob was dealt to the Astros, the Cardinals were in Houston to begin a three-game series.